Having a business checking account serves to legitimize your business and protect your personal assets. Read on as we explain how to open a business bank account and why it’s such an important step toward maintaining healthy finances. Why Do You Need a Business Credit Card? Separate Personal and Business Expenses: By keeping your finances separate you not only help maintain the “corporate veil,” but you also increase your chance of lowering your taxable income. By using a business credit card for your professional charges, you can better organize your tax-deductible expenses come tax season. 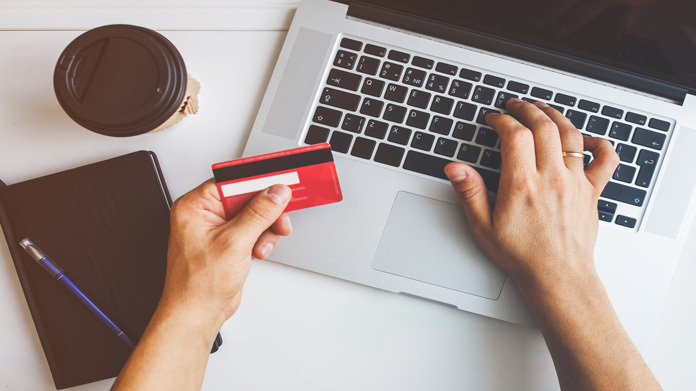 Flexible Finances: If your business needs to make a large purchase but does not have a lot of stored funds, a business credit card can help finance that purchase. This is especially important for freelancers and contractors. Stronger Credit: By using a business credit card responsibly, your business can establish a solid credit score. This can prove helpful if you decide to take out a loan or lower your interest rates. Rewards: Depending on the business credit card you choose, you can enjoy different rewards that can help your business grow. Find out more about why your business needs its own credit card here. Regardless of your business and its size, a primary qualification for a business credit card is an “authorized officer.” An authorized officer is a member of the company, oftentimes an owner, who is legally allowed to enter into borrowing arrangements with a financial institution. Most for-profit businesses are eligible for business credit cards whether they’re existing businesses, startups, or self-employers. A sole proprietorship can even apply for a business credit card with a Social Security number instead of an EIN. Most banks will look at more than just your business type when considering whether or not to approve you as a cardholder. Your existing credit score is a big factor in whether a credit card company will accept your application. If you are applying as a startup business, you will need to provide your personal credit score as proof that you and your business are good candidates for a business credit card. Businesses with a history of missed payments or late payments will have limited options when applying for a business credit card. Before deciding on a business credit card, consider the rates set forth by the financial institution. For example, some credit cards may have an introductory rate that offers a lower rate for new cardholders. One credit card penalty rate (activated when a cardholder misses too many payments) may be more forgiving than others. Airline Rewards: In exchange for making purchases, some credit cards offer an airline miles program that can save you money on traveling. Unlike frequent flyer programs through airlines, credit card airline rewards allow you to accumulate points based on your purchases. Some credit cards have expiration or “blackout” dates for accumulated miles, while others may have a limit on the number of miles you can earn at once. Cash Back Rewards: Credit cards can offer cash back on purchases made by a business. Not all cash back programs are the same. A flat rate cash back program earns you the same percentage on every purchase, while a tiered cash back program gives different percentages for different types of purchases. Many credit cards that offer cash back rewards require a good credit score to qualify. How Do You Choose the Right Card? There are many factors to consider when choosing the right card to suit your business. Some of these factors can limit your choices, such as your credit score. Only a handful of credit card companies will accept applicants with a low personal credit score. That being said, some offer options to help businesses build their credit. If your credit score is on the low side, consider looking at secured credit cards, which are easier to qualify for than unsecured cards. Another point to look at is the similarities your business credit card will have to a personal card. Some business credit cards match rewards and fees with their personal version. For this reason, it’s important to find a business credit card that adds additional benefits rather than duplicating ones you already have with your personal card. Legal Name and Address of Business: The official name and address that your business registered with the government. DBA Name: The name that your business operates under, if it is different from your personal name, another owner’s name, or the legal name of your business. Business Structure: Is your business legally structured as a corporation, a partnership, a sole proprietorship, or an LLC? Industry: The general category that your business falls under (e.g. agriculture, entertainment, manufacturing, etc). Role of Applicant: As the applicant, you will need to verify that you are an authorizing officer and are able to apply on behalf of your business. Ownership Type and Number of Owners: Is your business publicly owned, privately owned, or owned by the government? Date of Establishment: When the business was formed and how long it’s been operating. Annual Business Revenue: The approximate revenue of your business from the last fiscal year. Gross Annual Income: This is the combined income of you, the applicant, including full and part-time employment, seasonal employment, internships, contract employment, retirement benefits, Social Security benefits, and public assistance. Taxpayer Identification Number: Your EIN (or SSN, if you are a sole proprietor). SSN of Applicant: Most credit card companies require a personal guarantee from the applicant in order to qualify. Below are some highlights of the most popular credit card companies. American Express offers an option on their application page for existing members to log in and autofill their personal information. This can help save time when filling out personal information and may help in getting approved for a new card. Much like American Express, Bank of America features an autofill section directly on their application page for current members. Those applying for credit cards with airline rewards must provide their membership number for that airline if they are an existing member. New members will be assigned a membership number upon completion and approval of an application. Applicants also need to disclose whether they are a non-operating entity (e.g. holding entities, trusts, estates, personal investment companies), whether their business engages in internet gambling activities, and whether their business has any non-U.S. activity. If a business has non-U.S. activity — including imports, exports, office locations, donations, and wire transfers — they must then disclose what percentage of total activity is international. Potential Capital One applicants must report the approximate amount of business expenses used on credit cards per month prior to approval. The person applying must also include their annual income as well as their monthly housing payment. Applicants can elect to opt in for blank checks for cash advances at the time of application. When applying for a credit card through Chase, applicants can elect to add employee cards before being approved. For each employee card requested, the applicant must submit the personal information of the potential cardholder including their home address and SSN. Additionally, businesses have the option to transfer balances from another card company or store card. For this, you must provide the account number and the amount to transfer. Balances may be transferred from up to three separate accounts, and the total amount may not exceed the business’ available credit or $15,000 — whichever is the lower amount. For both of Citibank’s business credit card options, applicants will need either an AAdvantage membership number or a Costco membership number depending on their selection. If a business does not have an AAdvantage number, one will be provided upon completion and approval of the application. Additionally, much like with Chase applications, applicants can add up to three additional authorized users at the time of application. After being approved, more authorized users may be added by phone or online. Businesses wishing to apply for a Wells Fargo credit card online must have a Wells Fargo account holder complete the application. For regular business credit cards, the applicant or one of the owners of the business must have an established Wells Fargo checking or savings account (more than one year). For secured credit cards there are no time requirements to meet. Any applicant that does not meet the membership requirement must speak with a banker at a physical branch. Applicants also need to be U.S. citizens or permanent residents, and must provide proof of their citizenship status.